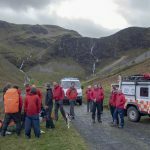 A 68 year old man walking with his nephew slipped descending the rocky path at Birkside beneath Nethermost Pike on the west side of the Helvellyn range. He took a 2-3m tumble suffering a head and lower leg injury. 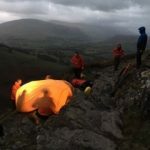 A member of Langdale Ambleside MRT was walking in the area and looked after him until the Keswick team were on scene. 2 teams of vehicles were away quickly from base parking at Wythburn Church car park and ascending by foot from there. Because the gentleman had been unconscious for a short time, it was decided to call for air support. Fortunately a coastguard helicopter was available and managed to land within 100m of the casualty site. The team put him in a vac mat because of the concern over C-spine injury and carried him to the helicopter, where he and his nephew were flown to Carlisle Infirmary.